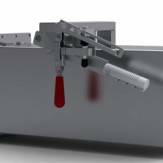 The Lock-Open Device will hold any Newton Kwik-Dump Valve in an open position. It can be ordered with any of our dump valves and installed at our manufacturing facility or can be ordered and quickly installed in the field on any existing AH Stock Newton Kwik-Dump Valve. The 106016-1 Extendable Handle will provide six inches of extra leverage for opening any left or right handle Newton Kwik Dump Valves. The extendable handle is available in mild or stainless steel. 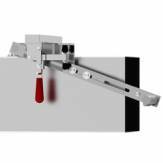 The 106016-1 extendable handle can be factory installed or installed in the field. Unlike our traditional lock open device, this lock open device fits on the valve (clamp) itself versus the handle and will keep your Newton Kwik Dump Valve in the locked open position.